Vegetarians will have to forgive me, but I firmly believe a person cannot have too many meatball recipes. They cook quickly, can be served with many different types of sauces, and leftovers taste as good or better as the first time around. This version was originally published in The Meatball Shop Cookbook, but it is also available online. I added my own twist to it, using almond flour instead of bread crumbs. I don’t have gluten allergies, just happen to love playing new twists on a classic. Combine by gently beating together the ricotta, eggs, almond flour, parsley, oregano, salt, red pepper flakes, and fennel in a large mixing bowl. When the mixture seems homogeneous, add the ground beef and mix by hand until incorporated. Roll the mixture into round, golf ball-size meatballs and place on a rack over a baking dish, allowing some space in between them. Roast for 20 minutes, or until the meatballs are firm and cooked through. 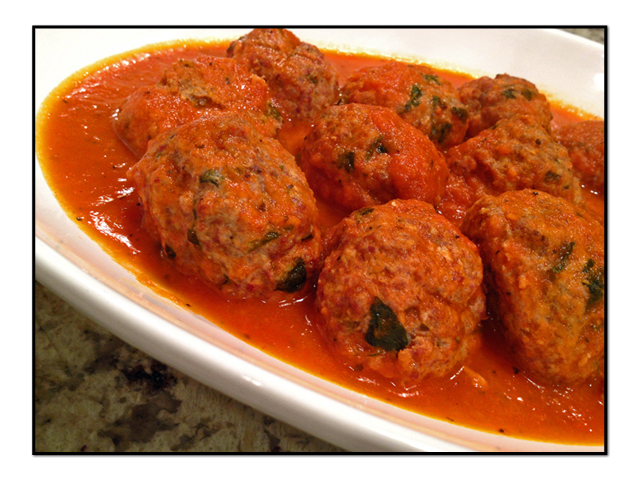 While the meatballs are roasting, heat the tomato sauce in a small saucepan over medium-high heat, stirring often. Add the meatballs to the saucepan, and simmer gently for 10 minutes. Comments: I do not remember the last time I fried a meatball. Baking works so much better! I am not even talking about excess fat consumption, but the whole preparation is much more user-friendly. Recently I found this cute baking dish with an insert that is perfect for cooking meatballs, as they sit elevated and the hot air circulates all around them. No need to mess with them once you start baking. After they are brown and almost cooked through, I add them to my sauce of choice, simmering them gently until serving time. The almond flour and the ricotta gave these meatballs a wonderful texture, creamy but not at all heavy. You can make them smaller if you prefer, but I like them to be more substantial. The tomato sauce I used was very simply prepared: a can of tomatoes simmered with sautéed shallots, celery, and carrots. Salt and pepper. A touch of orange zest at the end. I like your roasting pan very much as it sounds like a great way to cook the meatballs with minimal sticking or having to turn them over to get them evenly browned. The ricotta is a great addition to the meatballs to keep them moist and add flavour as well. I’ve had this recipe on my to be tried list for a long while, must get to it! Looks fantastic! 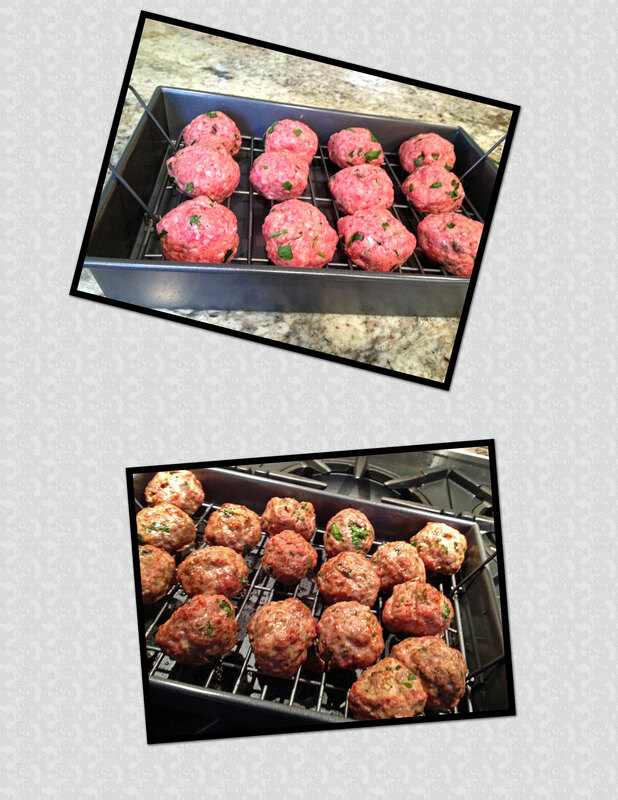 And you are so right about baking vs. frying the meatballs. I started baking them 20 odd years ago when we had our catering biz and would bake 3 sheet pans at a time! Have never gone back to stovetop meatballs! The rack idea is perfect, will be adding another piece of equipment to my traveling kit! I was never a big fan of meatballs, but then again, I never had them with ricotta in them. That sounds delicious – as does your sauce. I forgot about your orange zest trick in the sauce. I’m going to try that ASAP! I love a little orange on my tomato sauce, depending on what it will go with… in this recipe, perfect! I loved the almond flour here, hope you give it a try…. I always bake my balls! 🙂 This recipe sounds good. I am in complete agreement with you about meatballs. Especially when they are stuffed with cheese. I’ll be trying your almond flour – great idea. We really do share the same taste buds! Oh yes. This reminds me of Lidia B’s ricotta meatloaf. Your meatballs are definitely a must try. I cannot agree more with your first statement! Almond meal is a great twist and now I need to try that. Having a bit of a smile wonderfing what you are having for dinner tonight? Methinks not these beautiful meatballs!! Although I mostly do bake my meatballs I also have not added ricotta – that will certainly be remedied in the next few days!! You really wanna know? Well, you probably posted this yesterday, but still… tonight we had some Camembert cheese, Roquefort, and baguette in the hotel room… going for a last walk under the Eiffel Tower, early to bed to get ready for a full day traveling back tomorrow…. Au revoir, Paris! Ricotta meatballs?? I am so impressed.. intrigued…and now hungry! I could talk about these all day.. they look absolutely delicious.. I’ll be trying this recipe for sure. Beautiful. Yum. Hope you love them! Simple to prepare and very very tasty…. I agree, you can’t have too many meatball recipes. Ricotta meatballs have been on my list of recipes to try forever but with your new almond butter twist I think they just moved up to the top of the list ! Did I really bump them up? Nice! 😉 I hope you are doing great, Sawsan! I adore a good meatball, and Ryan was just saying he was in the mood for Italian. Perfecto! These look great Sally. And are you really in Paris? We’re going in September! September in Paris! Wonderful! That is definitely a trip to look forward to…. I LOVE The Meatball Shop! They’re veg meatballs are awesome and the.boy informed me that their regular meatballs are great too! If you ever feel that you’ve too many meatball recipes, Sally, just ship the surplus to me. The same goes for the actual meatballs, for that matter. These here sound terrific, with the ricotta keeping them nice and moist. I bet they don’t last long. Well, John, to be honest the leftovers went to the freezer, and that means we have some waiting for us… perfect option for an easy and tasty weeknight dinner! Really interesting with the almond flour, I bet the earthy sweetness it adds would be great! Those sound so good and I do happen to have some almond flour in the freezer! I haven’t made meatballs in ages. I know my husband would be thrilled too. Thanks for the inspiration! I love that pan and simply having meatballs in the freezer means you have a next-to-instant meal always ready. This looks quite delicious and succulent as well, Sally!